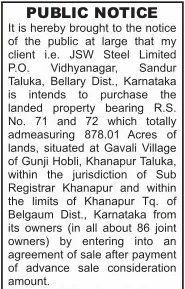 JSW Steel Ltd., Sandur Bellary intends to purchase property bearing RS 71 & 72 which totally ad-measuring 878.01 acres situated in Gavali village of Gunji Hobli, Khanapur Taluka from in all about 86 joint owners. If anyone has any tittle or right on the aforesaid land they have been informed to state claims. Sources say Survey no 71&72 are steep slopes covered with thick semi tropical rain forest & forms watershed for Mahadayi river. It’s inside Bhimgad Wildlife Sanctuary but private land. Starting from Vajara poha waterfalls to BHIMGAD. 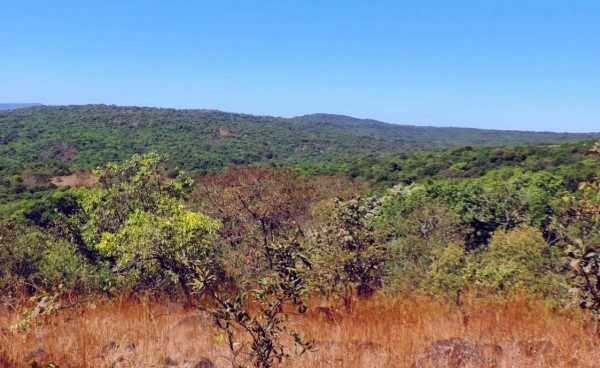 It forms an important part of wildlife area & Tiger movement trails. Basavaraj patil, DFO said that this matter has not came into his notice. However he said that JSW company was in search of land for the plantation of trees. According to the central governments regulations, if a company has bought 100 acre lands for industry they again have to buy 100 acre land for tree plantations. So I was aware that they were in search of such land. But I have not come across that they are trying to purchase land in Khanapur taluk he said. Gavali is one of a dozen villages and hamlets located in what is now the Bhimgad Wildlife Sanctuary in north-western Karnataka. Less than 200 people are regular residents, away from the busy world of roads, electricity or doctors. Villagers are often faced with wild animals that eat away crops and even attack humans. We should strongly oppose any such move where they are destroying dense forest cover.. this will dramatically shift the ecological balance of the entire area.. He has no Rights to destroy the Flora & Founa. Please registered GO stop / stay order for the project.